Bogor, West Java -Toyota Motor Corporation through its affiliate in Indonesia, PT Toyota Motor Manufacturing Indonesia (TMMIN) supports environmental sustainability education in West Java implemented by Conservation International (CI) Indonesia since 2003. This support actualized by handing over one unit of Toyota Hilux, as part of a global partnership between Toyota and CI in several countries. The car will be used by CI as an operational tool to support mobile education unit initiatives, part of environmental education activities that reach schools in West Java, especially areas that are unable to reach by regular car. This cooperation is a continuity from Toyota's Global "Today for Tomorrow" program that done since 2016, one of its activities is four units car grants per year to the environmental conservation organizations, including CI. This Today for Tomorrow program is also a realization of Toyota Global in realizing the Toyota Environmental Challenge 2050 commitment, especially the 6th pillar which is the challenge to build a society that is harmonious with nature. The car grant activity is located at SD Manggis Ilir Bodogol, one of the guided primary schools of Mount Gede Pangrango National Park (TNGGP) in West Java. Attend in today's activities include: Head of Gunung Gede Pangrango National Park Office Mr. Ir. Wahyu Rudianto, M.Si, Representative of Bodogol Nature Conservation Education Center (PPKAB), local government apparatus, Vice President of CI Indonesia Ketut Sarjana Putra, Vice President of Toyota Daihatsu Engineering Manufacturing Yoshiaki Ishimoto, Director of Administration, Corporate & External Affairs Division PT TMMIN Bob Azam, and Director of Production Engineering & Vehicle Manufacturing PT TMMIN Nandi Julyanto. "Toyota is committed to grow along with a society that is harmonious with nature, which is why we strive to build, develop and promote technologies that ensure harmony between environment and economy so as to grow harmoniously together. We are also building tight cooperative relationships with environmental conservation organizations that partner with the International Union for Conservation of Nature (IUCN), which has a major mission to conserve biodiversity," said TDEM Vice President Yoshiaki Ishimoto as Toyota Global representative. Toyota is the official sponsor of the IUCN Red List Project 2020 that targets the preservation of 160,000 rare/endangered species by 2020. "Currently, collaboration is an important key to successful conservation as governments, NGOs, the private sector, and communities can move together to support nature conservation. We hope this partnership will strengthen the awareness of many people about the role of the Gn National Park ecosystem. Gede Pangrango to keep stock and water systems in the downstream area including Jakarta. The concept of ecosystem connectivity from upstream to downstream is important to be understood together for sustainable management and conservation of nature," said Ketut Sarjana Putra Vice President of CI Indonesia. Further more, he expressed his appreciation for Toyota's support through the 'Today for Tomorrow' program initiative, as the real investment in conservation education implemented today will benefit human life in the future. "This donation is given with expectation to help environmental education and improving the effectiveness of nature conservation operations in West Java, especially in TNGGP, where CI has been a partner of this national park since 1998. We want to continue to clone this positive action with other partners, the benefits of conservation and environmental education can be learned early on by the students and also communities around the national park, "said Director of Production Engineering & Vehicle Manufacturing PT TMMIN, Nandi Julyanto. 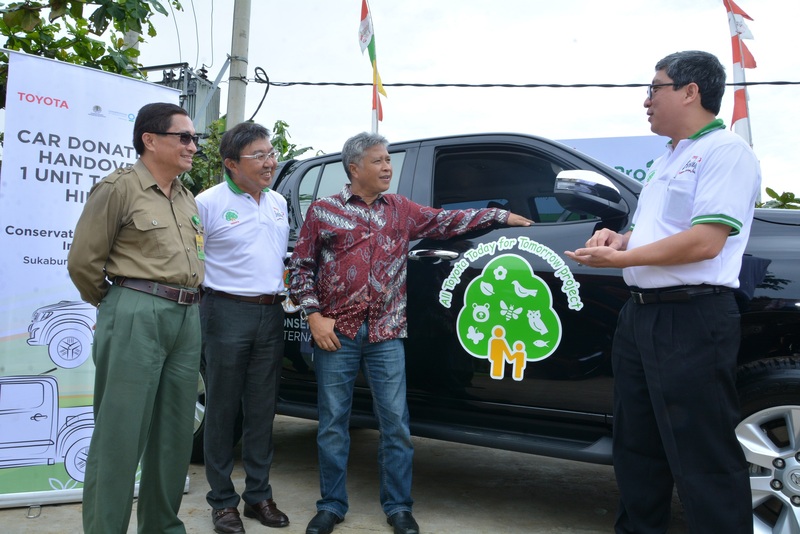 The donation of this car is a continuity of Toyota's global commitment, in education and environment, and especially environmental education, which is the focus of social contribution activities in Indonesia. On a separate occasion, Bob Azam, Director of Administration, Corporate & External Affairs Bob Azam stated, "For nearly 5 decades of grow and evolve in harmony with society and the environment in Indonesia, Toyota has always committed and ensured that every business activity from both upstream and downstream , always submit and obey the policies that organize the environment. " Head of Big Plaza Gede Pangrango National Park, Ir. Wahyu Rudianto, M.Si said that education has become an important key to the success of conservation because it encourages changes in people's behavior. He said that since the initiative of the Bodogol Nature Conservation Education Center (PPKAB) has run until now for 20 years, more than 70,000 people have received environmental education. "There has been many conclusive evidence from the benefits of education for conservation, one of them are the former peasants inside the area, now it become a community of Police Partners (MMP) of Forestry and partly educated to be interpreters. Children also get more new knowledge and as future leaders in their future they will be decision makers based on sustainable green principles ", he said. He also said that TNGGP's vision is to be a world-class conservation and environmental education center, therefore private involvement like Toyota together with CI should be a go-green effort to help actualizing that vision. TNGGP has become a vital life buffer for the livelihood of many people. As a producer of oxygen, clean water, also erosion and flood prevention has been proven by A study that total water production in the TNGGP region is mentioned to reach 231 billion liters of water per year. Basically, saving the forest is an effort to save our own lives ", he concluded. The environmental education initiative in West Java was marked by the establishment of Bodogol Nature Conservation Education Center (PPKAB), established in 1998, as the first center of nature conservation education in Indonesia within the conservation area. PPKAB is part of Mt. Gede Pangrango National Park, Technical Implementation Unit of the Directorate General of Natural Resources and Ecosystem Conservation (KSDAE) Ministry of Environment and Forestry (KLHK) supported by the Bodogol Conservation Education Consortium consisting of Big Plaza Gede Pangrango National Park, Conservation International (CI) Indonesia, and Nature Foundation of Indonesia Partner (ALAMI). Currently, PPKAB is trusted to be a role model in natural conservation education by KLHK so that the model of conservation management and education implemented by PPKAB can be replicated to various regions in Indonesia. Through PPKAB, visitors can directly learn conservation within TNGGP that has high biodiversity including various tree species, creepers, to epiphytes that become important ecosystems from a numbers of protected animals. Visitors can also enjoy the freshness of the air and the natural authenticity of the National Park through several spots including a tree canopy. The educational efforts of PPKAB also collaborate with a number of partners including CI Indonesisa, Owa Jawa Foundation, University and nearby Schools to reach more students. In 2003, CI Indonesia worked together developing mobile education unit program to visit schools and communities around the region to strengthen the understanding of conservation. Toyota Indonesia believes that environmental education is to cultivate and raise awareness of the importance of environment is one of the keys to environmental preservation. Therefore, other than donations to environmental education programs, since 2005, Toyota Indonesia has conducted the Toyota Eco Youth program which until the 11th year now has involved more than 260,000 students and high school students spread from Sabang and Merauke. Besided supporting the field of environmental education, Toyota Indonesia also regularly supports teaching and learning activities through donations of practicum tools such as machines and whole cars. About 169 engines and 47 cars have been donated by Toyota Indonesia to government institutions, educational institutions, and community institutions in Indonesia. For conservation activities, Toyota Indonesia has also run an intensified Toyota Forest program since 2003. Until now, Toyota Forest has managed to plant and maintain more than 1,300,000 trees with a target of 1,600,000 trees to be planted and maintained until the end of 2018. In the last 5 years, the Toyota Forest program has focused on planting and maintaining mangrove trees along the coast of Java. Starting from Kepulauan Seribu, 950,000 mangrove trees have been planted and maintained in Bekasi, Karawang, Cikampek, Brebes, Semarang, Bantul, Demak, Surabaya, and Banyuwangi areas. For almost 5 decades growing and developing harmoniously with society and environment in Indonesia, Toyota has always committed and strives to balancing its business activities and environmental conservation so that it aligns with life and reforestation activities. Through the spirit of "Toyota Berbagi" (Together Building Indonesia) consisting of three main pillars of Product Development and Technology,Industrial Development, and Social Responsibility (CSR), it symbolizes the spirit of Toyota to be with the government and society in actualizing a better Indonesia. Based on science, partnership and experience, CI empowers communities to take care of nature, biodiversity and improving human well-being. CI was founded in 1987, and has worked in Indonesia since 1991 to support a prosperous civil society through natural protection, sustainable production support and effective governance support. CI works in Indonesia in cooperation with the Ministry of Environment and Forestry (KLHK), Ministry of Marine Affairs and Fisheries (CTF), Local Government, and related partners. Toyota Motor Corporation (TMC) is a global company focused on providing mobilization for everyone with an existence of more than 80 years. Toyota is also one of the pioneers of electric vehicles by launching and mass-producing a Prius hybrid vehicle in 1997 and a Mirai-fuel cell vehicle in 2014. In Indonesia, Toyota started its business operations in 1971 and is committed to becoming one of the pioneers development of the automotive industry. For 47 years running its business activities, Toyota Indonesia transformed from an importer company into one of the production and export bases in the Asia-Pacific region. Toyota Indonesia has 5 production facilities located in Sunter-Jakarta and Karawang-West Java. TNGGP is the last forest ecosystem area in Java Island which has an area of about 24,278.85 hectares that has an important role in the history of conservation areas in Indonesia. TNGPP is also the starting point for the four main watersheds in West Java which are Ciliwung, Cisadane, Citarum and Cimandiri, providing clean water for 30 million people. This region also supports the life of various protected species, they are Javan gibbons (Hylobates moloch), Javanese eagles (Nisaetus bartelsi), Javanese leopards (Panthera pardus melas), surili (Presbytis comata) and Javanese slow loris (Nycticebus javanicus). The Bodogol Nature Conservation Education Center was established in collaboration with Big Plaza Gede Pangrango National Park, Conservation International Indonesia and Nature Foundation of Indonesia Partner. PPKAB is a place to get to know the tropical rain forest life. This place is in the area of Mount Gede Pangrango National Park, precisely in Bodogol Resort Management Section of National Park Region V in the Field of Management of National Park Region III Bogor.